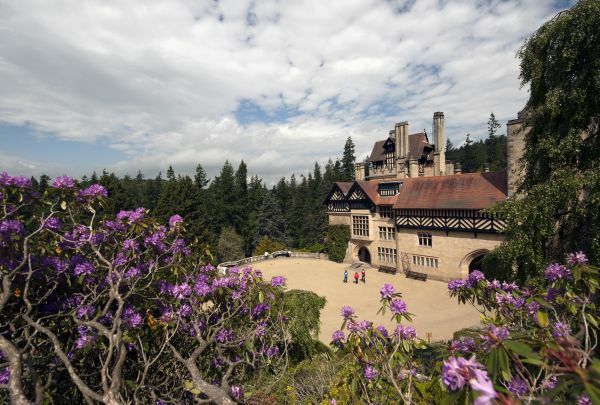 Home > News > It’s Rhododendron time at Cragside! The Rhododendrons at the National Trust Cragside are now bursting into bloom, transforming the estate into a sea of colours. Impressive displays of Azalea’s compliment the great drifts of Rhododendrons throughout the estate that was once home to the innovative Lord Armstrong. The combination of hardy hybrid Rhododendrons, popular in Armstrong’s time, with conifers introduced from North America has culminated in the landscape growing into a truly magnificent Rhododendron forest. The Azaleas are the first to flower in a wonderful array of bright and pastel colours including red, orange, pink, white, yellow and bi-colours. The colours stand out amongst the fresh green new growth and many of the flowers are highly scented. The evergreen Rhododendrons have a more subtle colouring including red, white, pink, purple, and mauve coloured flowers. Some of which are delicately feathered with darker markings, making the blooms even more spectacular. The blooms are usually at their best in June and the display only lasts for a couple of weeks. Creation of Lord Armstrong, Victorian inventor and landscape genius. Gardens, red squirrels, woodland and lakeside walks.